Entertain your friends when you next share a glass of the good stuff, or use the facts to convert newcomers over to enoying and appreciating the traditional real cider! 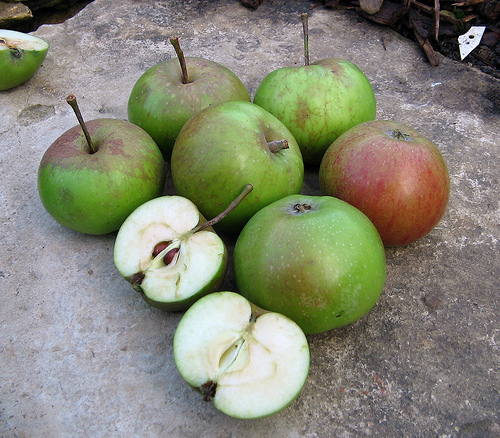 Cloudy, unfiltered ciders made in the West Country are often called “scrumpy”, from “scrump”, a local dialect term for a small or withered apple. Over two million new cider apple trees have been planted since 1995 (to 2006). In the 14th Century children were baptised in cider, it was cleaner than the water! Farm workers’ wages in earlier times included four pints of cider a day. Captain Cook carried cider on his ships to treat his crew for scurvy. At one time, 365 different varieties of cider apples were grown. One of the earliest written references to Cider can be found in the Wycliffe ‘Cider’ Bible, printed in the early 15th Century. The Bible gets its name from the translation of the verse ‘For he (John the Baptist) shall be great in the sight of the Lord, and shall drink neither wine nor strong drink…’. The Cider Bible uses the word ‘cider’ (sidir) for strong drink and it can be viewed today in Hereford Cathedral’s Chained Library. The first listing of cider presses as a source of income appears in 1230 in a Royal Charter granted to Jocelin Bishop of Bath. Around 13% of UK adults drink cider at least once a month while 49% drink wine and 51% drink beer. In 1664 John Evelyn wrote ‘Generally all strong and pleasant cider excites and cleanses the Stomach, strengthens Digestion, and infallibly frees the Kidneys and Bladder from breeding the Gravel Stone’. Cider is equally enjoyed by men and women, but women drink half the volume of men. The volume of cider produced annually in the UK is in excess of 6 million hectolitres or 130 million UK gallons. The value of UK cider sales doubled between 2004 and 2008. Since 1995, orchards have planted over 2 million new apple trees. 45 per cent of all UK apples are now used to make cider. There are over 365 different varieties of cider apples.